Drivers are looking forward to Pottery Road re-opening this week after a long and troubled reconstruction. The new road brings improvements for pedestrians and cyclists too, but we’ve been enjoying them for months already. 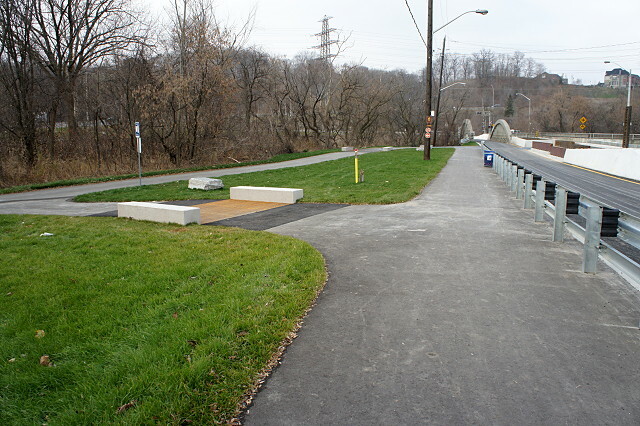 Although the road has remained closed to vehicular traffic between Todmorden Mills and Broadview Avenue since May, pedestrians and cyclists have been able to navigate Pottery Road from top to bottom throughout the project and the main pathway has been all but complete since early September. The most immediately visible (and likely to be controversial) improvement is the line of sharrows in the middle of the downhill/westbound lane (top and above). They’re meant to indicate that cyclists heading west should take the middle of the lane all the way down the hill past the DVP and that car drivers should wait behind them. Why is this going to be controversial? Because many car drivers will hate and/or not understand having to drive behind bikes, and many cyclists will simply refuse to ride down the middle of the lane with cars behind them. 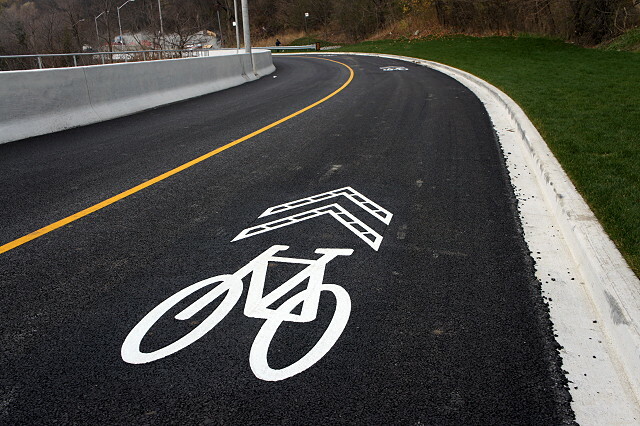 A confident cyclist can travel at least 50-60 km/h down Pottery Road and should have no trouble taking the lane. But I think that this sharrowed lane will see a small minority of Don Valley-bound cyclists, with most instead opting for the path at the side of the road. The path has been widened considerably and is the preferred option for all cyclists heading up the hill. 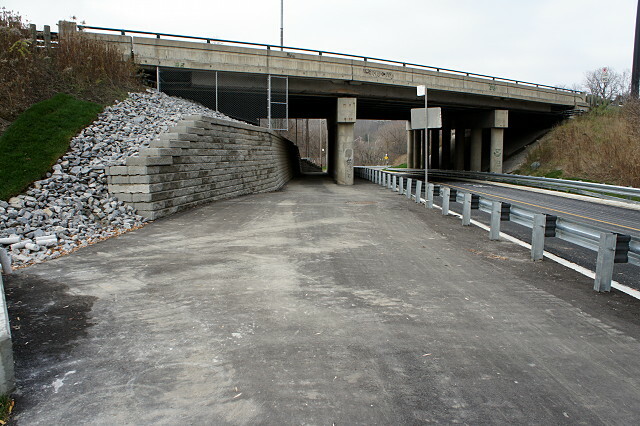 The widening was accomplished largely by claiming space that had been used for a shoulder, moving the concrete barrier closer to the traffic lane. Before May, cyclists had a bleak choice to make when it came to going uphill: join traffic on the left side of the barrier, which required taking the lane in two places (not easy for most cyclists when plodding up a hill like Pottery Road) or take the pathway, knowing that it was in terrible condition and too narrow to comfortably pass a pedestrian or cyclist heading in the other direction. The new path is in excellent condition and is consistently wide enough for both cyclists and pedestrians travelling in both directions. My only hope is that cyclists who want to bomb down the hill will stick to the traffic lane rather than taking the path. The path used to disappear where the road goes under the DVP, passable only by determined pedestrians. Cyclists were forced to take the road. 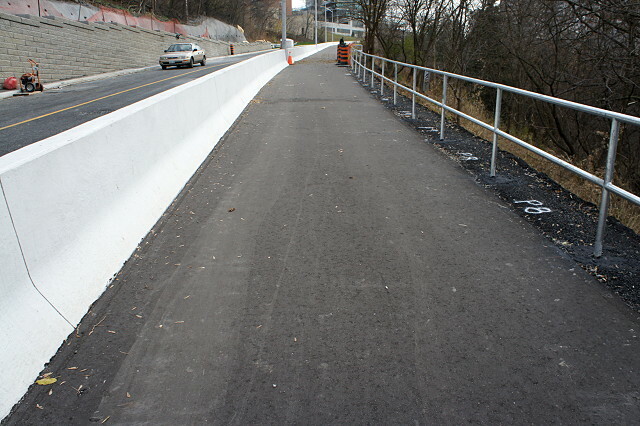 The reconstruction has opened up this part of the path with a retaining wall giving lots of room for comfortable passage and allowing cyclists a direct connection to and from the Lower Don trail. This is the new connection from the pathway to the Lower Don trail heading south, which in turn connects up with the Martin Goodman trail at Lake Shore Boulevard. I’ll have a closer look at this intersection in the next post. 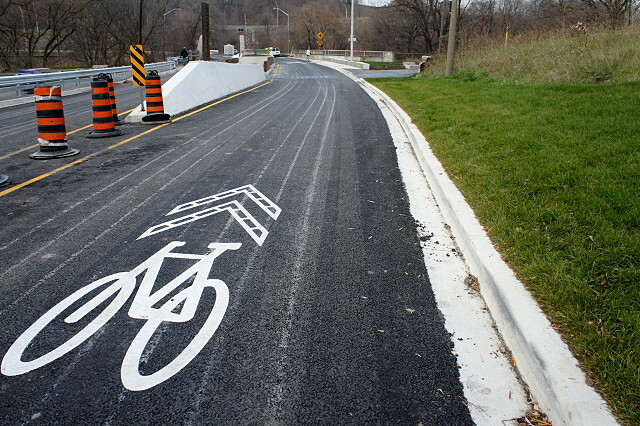 At the top of the hill at Broadview, small arrows painted on the pathway direct cyclists over to the left, where a curb cut takes them into Toronto’s shortest bike lane, running about 3 metres from the curb to the crosswalk. It’s a nice touch that takes cyclists back onto the road with minimal effort while reducing conflict with both pedestrians and motorists. As far as they go, the reconstruction provides a big step forward for cyclists trying to access the Don Valley via Pottery Road. As someone who rides up and down this street regularly, I’ve already come to appreciate many of the changes, especially the added width of the path and the connection to the Lower Don trail. I’ll address the Lower Don connection and some of the places where the infrastructure could be improved in the next two posts in this series. ← Previous Previous post: When is it acceptable to delay someone's commute? I can’t help but think that, despite the good intentions, this is going to be a disaster. Maybe it’s just an optical illusion, but when I was walking up the road last week, it appeared to me that the lanes are narrower than before. With the barrier on the south side, I can foresee some drivers getting too close to (or over) the centre line. It makes sense to use the road for the downhill ride — the non-nervous cyclist should be able to rip down the hill as fast or faster than the car traffic. I’ve hit 50 or 60 km/hr on the old road, even with the lousy state of the surface. But I’m not sure that those sharrows are a good idea. My fear is that some drivers who are not familiar with the road are going to think that it’s a bicycle lane, and then, concluding that they must be on a one-way road, will move over to the oncoming-traffic side. As for the path, is it really a good idea to encourage cyclists and pedestrians to mix on what is really just an asphalt sidewalk? People walking in both directions, struggling cyclists coming up the hill, and somewhat faster bikes coming down. It’s a wide path, but not wide enough to accompany all of them at the same time. I’ve ridden down the path a number of times since September, frequently with pedestrians coming the other way, and there haven’t been any conflicts. Mind you, I’m riding the brakes and being courteous, not trying to set any land speed records. The path is spacious, but I don’t think it lends itself to cutting loose on the way down. 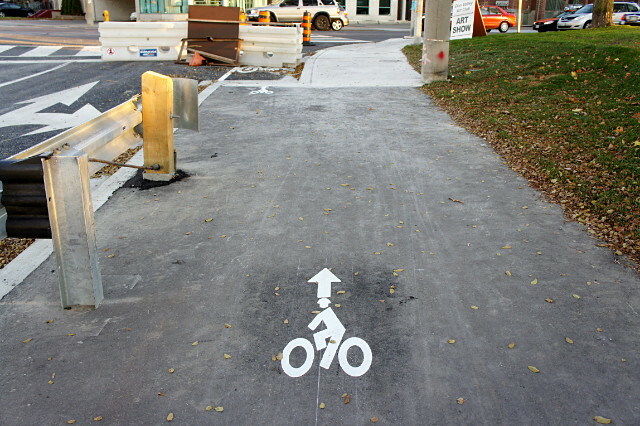 When Ward 29 Bikes met with city staff about the Pottery Road project in March, they said that the pathway was supposed to be for pedestrians and up-bound bikes only, with all down-bound cyclists taking the lane and riding in traffic. Personally, I don’t see it happening. This scheme works well for me but there’s no way my wife would ever ride down in the middle of the lane; she’ll be cruising down on the path. I’m hoping that speed demons will stick to the road. The city will likely end up installing cattle gates if there’s too much speeding down the pathway, and that would be bad for everyone. I think the road will work well enough for both cyclists and motorists. The key will be to keep impatient drivers from trying to pass bikes. Before the construction, I always took the lane when I rode down Pottery Road. I was usually going 60+ by the bottom and was still at 50+ by the time I got to the bridges, but that didn’t stop the occasional yahoo from flooring it to try to get around me. I’d inevitably pass them again when they slowed down at the railroad tracks.